Tough inshore saltwater game fish and conditions can put ordinary spinning reels out of commission in a hurry. 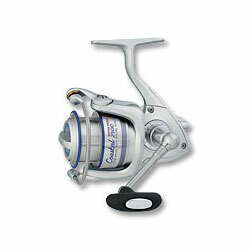 But Daiwa's Coastal Inshore models are no ordinary reels. Every material and component from the rugged aluminum frame, to the seven corrosion resistant CRBB ball bearings, to the ultra-consistent waterproof drag have been carefully selected with these special demands in mind. Features 8 bearings (7 CRBB, 1 roller), multi-disc precision drag, DigiGear digital gearing, tubular stainless Air Bail for strength and light weight, Twist Buster line twist reduction, Advanced Locomotive Levelwind, Infinite Anti-Reverse, long casting ABS aluminum spool. "Light weight construction and Daiwa's quality. Got the 3500 and paired it up with the new All Star ASR Series (Redfish edition). Sick combo!" "I bought a Daiwa Coastal 3000 at BPS store in Orlando, and 1 month later IMMEDIATELY sold my Shimanos and bought another 3000. I use them for Tarpon, Snook, Jacks, Reds in backcountry fishing applications with 10-20lb Suffix braid. " "I thought this reel would be like the coastal bait caster. It was not. Yor would have to go to seven years of med school to take this reel apart. I do not like the plastic all over this reel. It has more screws than a hardware store."